Fancy Dress Factory.... 352 - Disney's Minnie Mouse 888584 adult medium. Sections / Couples costumes / Disney's Minnie Mouse 888584 adult medium. Disney's Minnie Mouse 888584 adult medium. 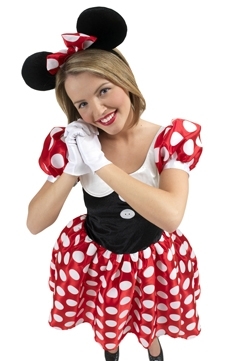 Disney Minnie Mouse costume: Dress, gloves and headband with ears. Ladies medium approx ladies 12-14.